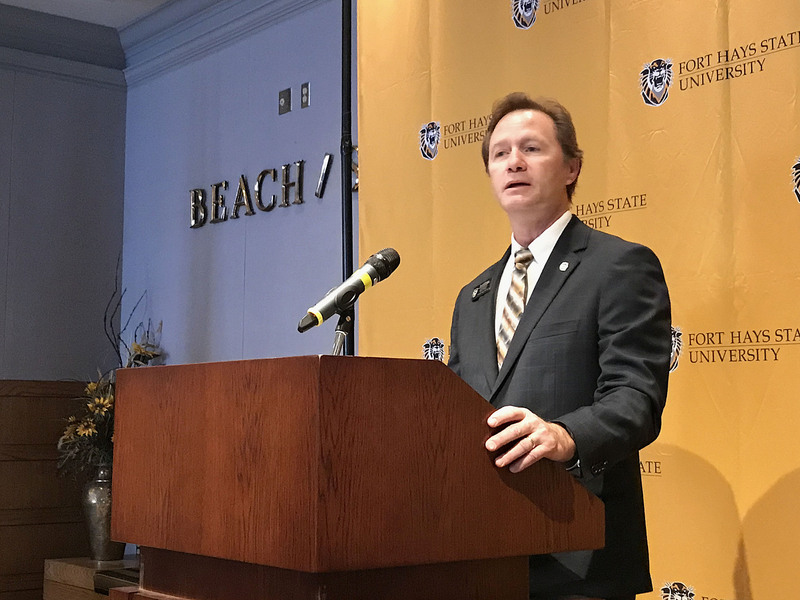 HAYS, Kan. – A more than 30-year tradition at Fort Hays State University continued today when the university’s president’s tour of Kansas began with a news conference in Sheridan Hall on the FHSU campus. However, this year’s tour features the acting president, Dr. Jeff Briggs. University President Tisa Mason is recovering from an illness that has significantly reduced her ability to speak. Acting President Briggs will make stops to visit with media and alumni in 12 cities during the week of Nov. 12 to Nov. 15. Schedule changes reduced the tour by a day from the original schedule. The annual tour has been a tradition at Fort Hays State since 1987, when it began as a tour of western Kansas by then president Dr. Edward H. Hammond, who went on to serve 27 years in that post. “This tradition began more than 30 years ago, when a new president – some of you may remember Ed Hammond – decided that the story of Fort Hays State University, who it is, why it is here, what it is doing and where it is going, was not a secret to be kept in Hays America but needed to be told everywhere he could take it,” said Dr. Briggs. He cited several markers of success for the university, including an 18th consecutive record headcount 20th-day enrollment this fall of 15,523 students, 423 more than last year. The year the tour started, the university had a 20th-day enrollment of about 5,500. He also cited this fall’s Washington Monthly rankings of universities across the United States. The Monthly’s ratings focus on adult and part-time learners, measuring them in terms of accessibility and perseverance. The magazine mined data from thousands of schools and from the federal government. By that measure, out of 1,124 four-year institutions that met their criteria, Fort Hays State is one of the top 10. A key part of accessibility, he said, is affordability, and he highlighted a graphic in the current issue of the Kansas Leadership Center Journal, which compared rising costs at Kansas Regents institutions. Their data showed that for the 2018-2019 year, tuition and fees for 15 credit hours at Fort Hays State are only $24.46 higher than if they had only covered inflation since the 2007-2008 academic year. He noted that the FHSU Foundation’s $100 million Journey campaign, supported by over 7,000 donors annually, and launched publicly at Homecoming 2016, has to date raised $68 million. The campaign is scheduled to end at Homecoming 2021. The Pillars of the Journey Campaign are Student Scholarships, Support of Academics, Student Life and Athletics. Private donations to the campaign provided $6 million immediate financial support to FHSU last year, $2 million of which went to student scholarships. “In addition to immediate support, many donors have endowed their gifts to provide support today, next year and in perpetuity,” said Dr. Briggs. An expanding campus: two major student residence halls, Victor E. Village and Tiger Village opened this year; the Center for Applied Technology and Sculpture opened last year; and the art and design building will be ready for students next fall. Full-time, doctorally prepared faculty teach freshmen. The new Doctor of Nursing Practice program had its first graduates last spring. The university’s intensive focus on undergraduate research. Partnerships with community colleges around the state, making the transfer from associate programs to baccalaureate programs as smooth as possible. A focus on service, as in the Hansen Internships through Career Services and free hearing screenings in rural areas though the Communication Sciences and Disorders program and its partnership with the Kansas Masons.